Ta-da!!! 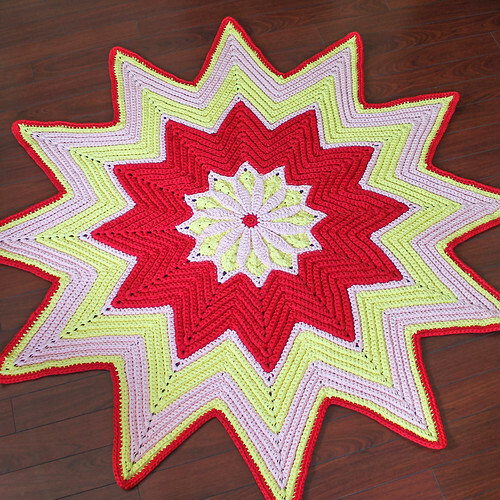 Thanks to you guys with your help on my flower dilemma, the rug is finished and I love it! 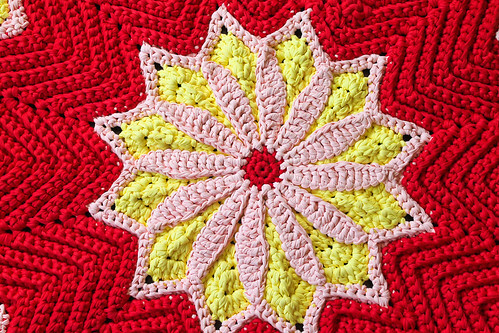 I decided to go with the majority vote for the flower in the center because I think I'm going to try to sell it at my local craft fair this summer! If it was going to be for me I probably would have opted to go without it, since I tend to gravitate towards a more minimal color blocked look. Although, after having the flower on and off the rug so much in trying to decide, the rug started to look like it was missing something when the flower wasn't on there! Sewing the flower on was a little time consuming. I wanted to make sure it was sewn nice and tight, but I also had to work on it laid out flat on the floor. 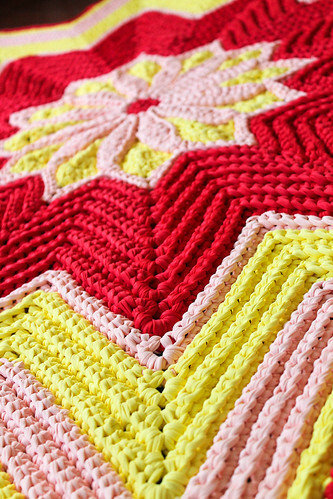 Good thing the rug was nice and comfy to sit/lay on because it was quite awkward to sew! What's the final size you say? 62 inches! Just over 5 feet! 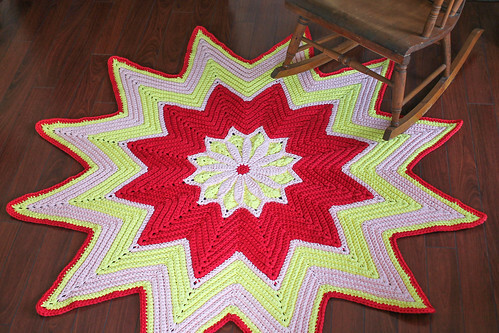 I really like the texture that was created by crocheting in the back loops and turning the rug over after each round. Here are some shots with a rocking chair for better size reference. Is it weird I picture this rug in a bright modern nursery, (with wood flooring, white walls, and fun art for some pops of color, to be even more specific)? 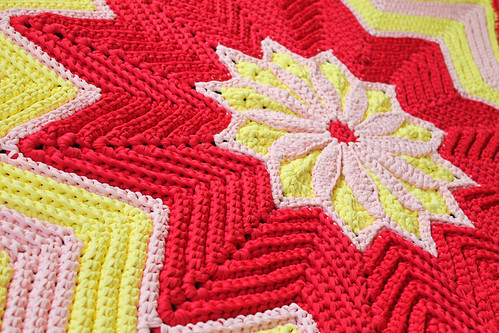 It's pretty soft which would be great for a baby to lay/crawl/play on! It looks so lovely and cheerful! 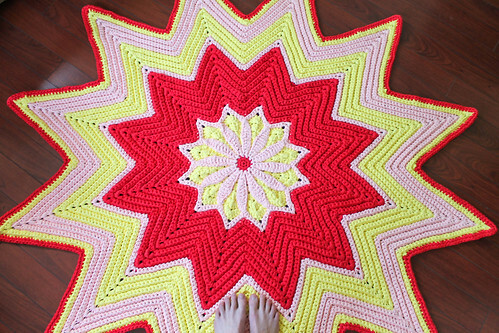 The colors would brighten up any room no matter what the floor and walks are:) I must give it a try too, but I cannot make that big, may be, a smaller version :) which yarn did you use? Well, it came out gorgeous!!!!! Thanks Samantha!! I had to stand on some furniture to get the whole rug in some of the pictures!! 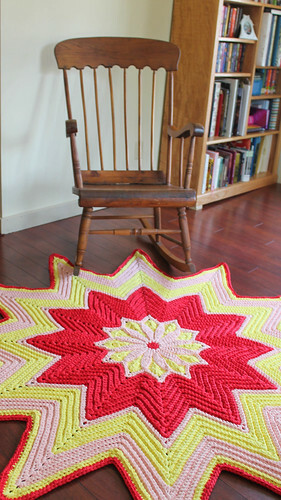 That rug is so eye-catching and it turned out quite big too when I see it under the rocker. That centre flower looks just great! So cute! Love how it looks under the rocker. The flower looks great, worth the work for sure. LOVE it! It's perfect, Kate! Cute flower in you latest post too! This is soooo awesome! I LOVE it!